Cryptothrills Casino will then reward you with a bonus (Welcome Bonus is for new players only). The terms and conditions of the bonuses vary between different casinos and might also change over time and between different countries, so it is important to compare the different offers and read the T&C for Cryptothrills Casino before signing up. In a world where tracking and data collection is reaching ridiculous levels, privacy minded gamblers need options. And that option is exactly what Cryptothrills offers its players. There is some trouble in paradise from the get-go, however – the lack of any license. This casino is not licensed by any gambling commission, so keep that in mind if you choose to play here. The number of available games could also be expanded. There were a total of 124 available titles, and that includes slots, table games, video poker, and keno. All of the casino software seems to be provided by Genii and Saucify. We were unable to find any information on the operator’s games being independently audited for fairness. They do have a sleek user interface, and a great way to filter through the available selection of games to find exactly what you want. Sort by game category, available special features, and the number of paylines. You can also filter multiple at once to specify exactly what you want. Such an expansive search system tells us that Cryptothrills has ambitions to bring more titles and developers to their platform. The current selection has a fair bit of game variety, but it is provided by only two developers. Larger names like NetEnt, Microgaming and Nyx Gaming, are nowhere to be found. That said, the search function could also use some extra work. There is no way to distinguish what titles were recently added, and some filters seem to be permanently enabled. There is also no way of searching for a specific developer. At one point, the search bar seemed to break and failed to display any results. However, we were able to fix this by reloading the page. Of the 124 games currently available at Cryptothrills, 104 of them are slots. The selection is smaller than most other casinos, which is somewhat of a disappointment. With only crypto currencies being available, and a lack of license, the casino may have trouble attracting providers to their website. Using the filters, players can choose the number of paylines, and what sort of special features they would like to see. On top of that, the search function is incredibly smart. It works within the limits of your selected filters, and it will display all games with the word you are searching for. If you are not entirely certain about the name, even a partial one will help you find it. We do wish Cryptothrills provided basic information about a slot before you launched it, or even a demo version. As it stands, gamblers cannot try a game before they commit to playing it. Admittedly, demos might be more trouble than they are worth for the casino. But some basic information about each slot like its RTP, available bonuses and playing field would be very useful. With a total of five table games, your selection is incredibly limited. Doubly so when you realize you have a single roulette title and four blackjack games. Players that enjoy other table games like baccarat will want to seek greener pastures for now. The operator has a decent selection of video poker and keno titles. There are 11 total video poker games, each with slightly different rule sets to add a bit of variety. For keno, Cryptothrills offers 4 different types. Bingo, lotto and scratch-cards are absent, and we hope the operator adds them at some point. Sadly, no live casino titles are to be found anywhere. There is no category in the filter list or any mention of them in the T&C. As a result, we feel safe in speculating the casino does not plan to add any live games right now. This may change later down the line, but it seems to us that Cryptothrills would prefer to focus on slots and video poker. As the operator’s name implies, only crypto currencies are accepted. When registering, gamblers can choose Bitcoin (BTC), Bitcoin Cash (BCH), or Litecoin (LTC). Pick one you will stick with for the long-term. Per the website’s FAQ, you will only be paid out in the same currency you selected when registering at Cryptothrills. Withdrawals are made to the player’s wallet address, and are usually instantaneous. A brief audit is carried out, which takes 30 minutes at most. This blows traditional withdrawals out of the water, and is one of the advantages of betting with crypto currencies. You have a weekly limit as to how much you can withdraw. This limit increases the higher tier you are. New players are capped at 400 mBTC per week. Minimum withdrawal is set to 10 mBTC. Withdrawals of straight deposits or deposits with match bonuses have a 2 mBTC withdrawal minimum. 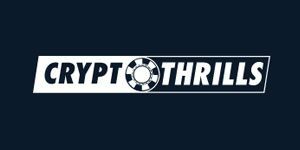 Players who never made a deposit at Cryptothrills cannot withdraw any money. Should something go wrong, you can contact the operator in two ways. First, you can go to their contact page and send them an e-mail. Or, if you do not want to wait, you can click the yellow speech bubble in the lower right corner. This opens a live chat window, where you can speak with support directly. Cryptothrills boasts 24/7 support every day of the week. From our testing, support was always able to get back to us in a reasonable time period.